I've mentioned this before. Where I live is vacationland, USA. 25 miles or so South of Boston and right on the ocean. 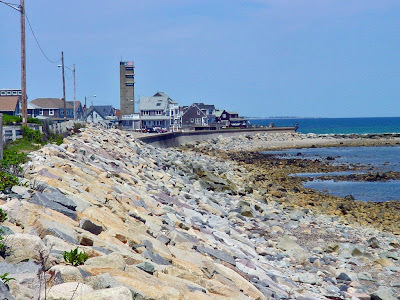 But, I drive to Maine, Nova Scotia etc., and get out of the car oohing and aahing over the scenery which would include little harbors with lobster boats in them and craggy rock lined coasts. You know what they say about the grass being greener? This is my backyard. DUH! This is the site of my train painting and an early version of it between wiping and scraping. I was right next to the tracks where the miniature Lionel comes around with the folks on it. Here they come. TOOOOOT TOOOOOOT :D See you all soon.